The doctor said this was a heptocellular carcinoma. Subsequently, Gan was referred to a university hospital for further treatment but he did not follow up with that. He opted for herbs instead. He came to see us on 6 August 2000. He did not have any discomforts except that around midnight he had mild fevers. He was put on liver herbs. Gan responded well to the herbs. After a week, his appetite increased. He slept well throughout the night while previously he had disturbed sleep and was awakened every hour of the night. He felt more alert or energetic. He looked much better than before. The midnight fevers had also disappeared. On 10 September 2000, Gan told us that he had more energy and was able to go jogging. On 21 September 2001, i.e., one year and two months on the herbs, we met up with Gan again. 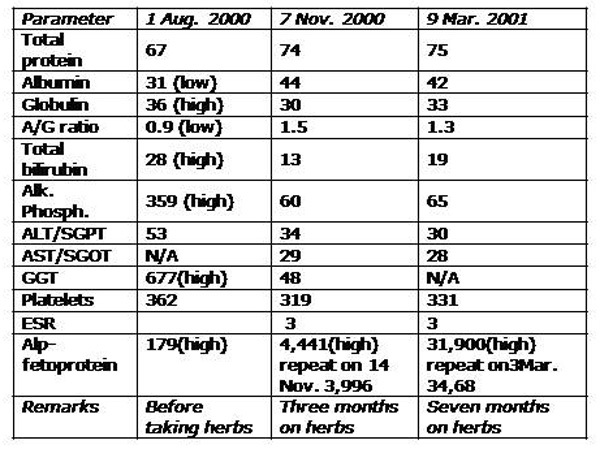 He also told us that he was not going to do any more blood tests since the alpha-fetoprotein levels had increased from 179 in August 2000 (before taking the herbs) to 88,917 in June 2001 (after taking the herbs). He did not see any point knowing about it anymore. However, he was doing fine and had gone back to work as a mechanic. He had no symptoms or discomforts. The alpha-fetoprotein values on 4 May 2001 and 27 June 2001 were 47, 800 and 88,917 9, respectively. Gan obtained amazing relief from all his symptoms after taking the herbs for just one week. He was able to sleep, eat and work. Again, this case points to the fact that our herbs are not toxic to the liver. After three months on the herbs, the results of his liver function went back to normal. We did not know what else could be done for him. Perhaps, this is a case of live and let live and hoping for the best. Of course, Gan had the option of going for surgery or other medical interventions which he, from the very beginning, declined. Looking at it from the positive viewpoint, Gan did not fare that badly compared to those who opted for medical treatments. Perhaps he had made the correct decision. 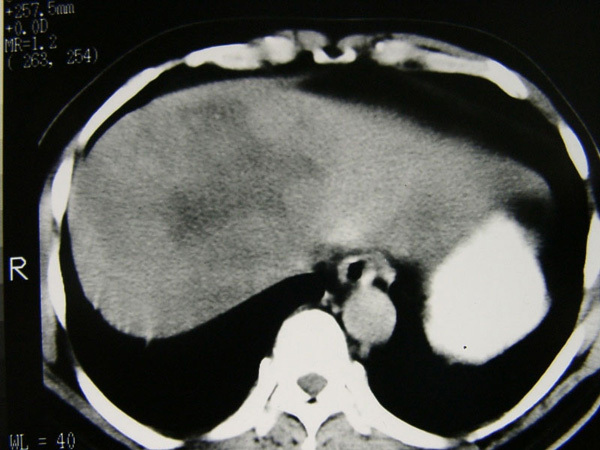 Many who had surgery died soon afterwards, while others developed more tumours in their livers. Gan died without suffering on 31 December 2002. Review of medical literature showed that survival without treatment for liver tumour was only 1 to 4 months. 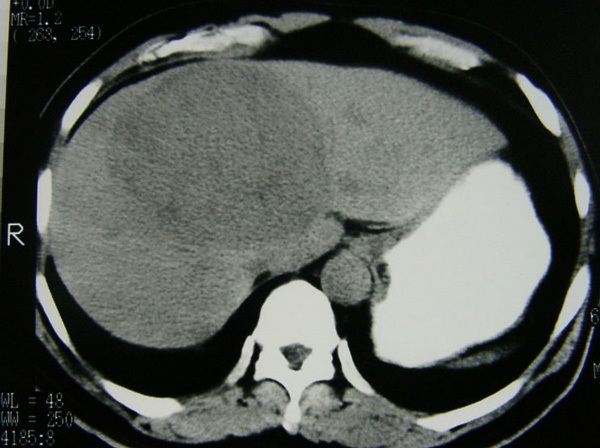 For those with tumour larger than 6 cm, the mean survival without treatment was 3.5 weeks. Gan lived without suffering for 2 years and 4 months. We could not ask for more.